On the Italian island of Sicily, about 70 km from the capital city Palermo, is a huge labyrinth of concrete hugging the side of a hill like an enormous grey-white tortoise shell. The maze of pathways through this concrete slab precisely corresponds to the street-plan of the old town of Gibellina that once stood here before it was destroyed by an earthquake in 1968. The Belice earthquake that rocked the island on the night of January 14 and 15 affected about a dozen towns. Gibellina suffered the most. Unfortunately, relief efforts were as disastrous as the earthquake itself and thousands remained homeless for years after the disaster, living in temporary prefabricated houses near the ruins of their former homes. Eventually, the ravaged towns were abandoned and rebuilt in new locations. Gibellina too was moved to a new location about 20 km away as the crow flies. Unlike other towns in the earthquake devastated Belice valley, new Gibellina was built with extravagance featuring public gardens, large piazzas, post-modern buildings, wide roads and numerous works of gigantic contemporary sculpture created by Italy’s top architects and artists. 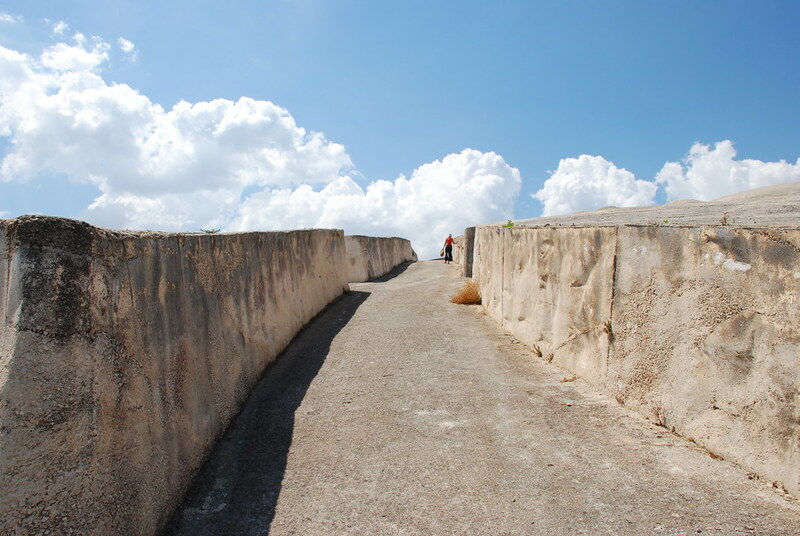 The project, known as the “Dream in Progress”, was designed to turn Gibellina into a modern open air museum. In 1983, the mayor of Gibellina invited the internationally renowned artist Alberto Burri to visit new Gibellina. While visiting the ruins of the old town, Burri began to envision a gigantic monument created out of the rubble, which would not only be a fitting memorial to those who had died but also be an artistic link between the old and new towns. Called “Cretto di Burri”, the monument is a huge slab of concrete covering the entire area of the old town of 29 acres. Nearly five foot of concrete was poured over the town, as if a shroud had been laid over the ruins. It engulfed everything from dead trees, collapsed buildings, and broken furniture. While covering the town with concrete, the layout of the original town was preserved, leaving the streets as pathways throughout the concrete. While Cretto di Burri is an awe-inspiring work of art, some people were upset at the way the history of the old town was obliterated. “…descendants of people from "old" abandoned Gibellina would have nothing but an anonymous concrete edifice to commemorate their deceased kin,” wrote Antonella Gallo on BestofSicily.com, while it described new Gibellina as “an ugly settlement”. Nevertheless, a visit to Cretto di Burri should be a fascinating experience.